If you’re the “go big or go home” type, check out the amazing kid-sized Mud Run created by AKA Jane Random. With several different messy obstacles, like a slippery mud slide and a goo-filled kiddie pool, we can see a whole lot of kids having a blast getting really, really dirty. 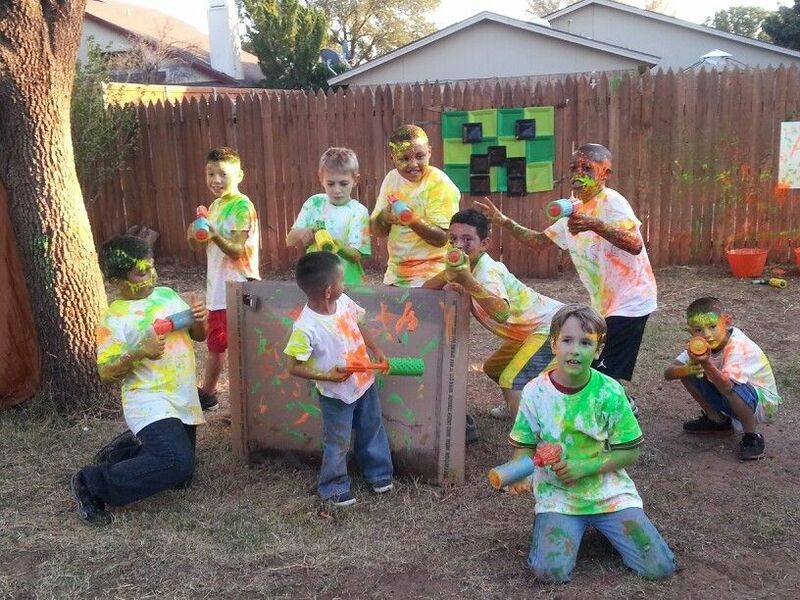 Visit the site for lots of fun ideas for a messy birthday party. Our curious kids won’t turn up their noses to a little weekend science when it’s as entertaining, mess-making, and sometimes explosive, as shown in the hilarious photo from Serving Up the Skinny. 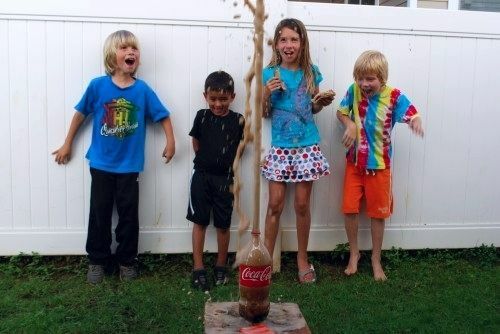 From the infamous “Mentos and Diet Soda” experiment shown above, to the is-it-a-solid-or-a-liquid? duality of Oobleck, your kids will be asking to do Summer School if it’s this fun. Also, check out Education.com which is one of our favorite resources to keep kids busy learning in the most fun ways possible. 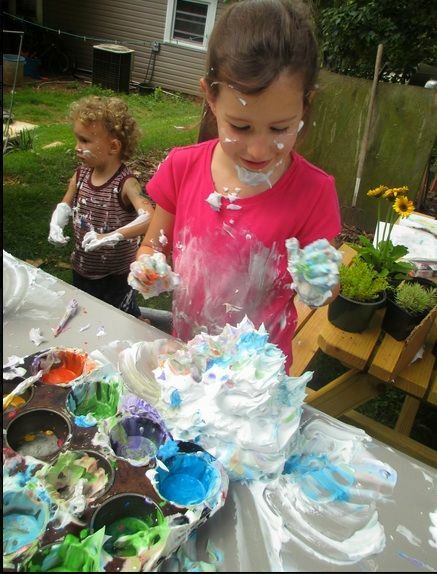 Playing with shaving cream is a messy activity that kids of many ages will be eager to do, though we love seeing how the older kids at The Root Children turned sensory play into an art project. Just add paint and lots of imagination and see what they sculpt out of shaving cream. Don’t underestimate the fun kids will have with just some dirt and water, as evidenced in the birthday mud party put on by the intrepid Meg and Andy. And this isn’t just for suburbanites! 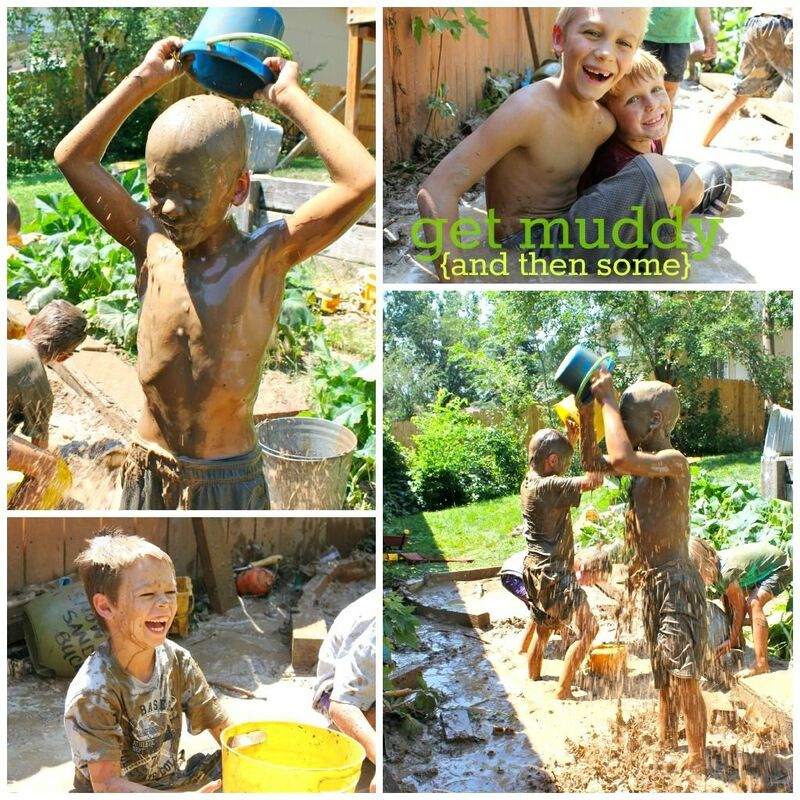 We love that they were able to create this much mess in a small city backyard, and you can too, proving you don’t need much space to get a group of kids really, really muddy. And really, really happy. 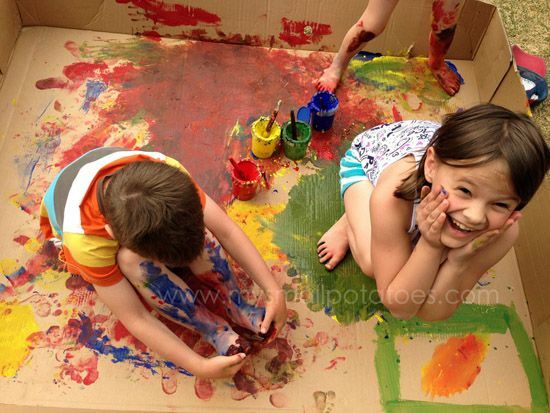 A large box becomes an art canvas, and a sort of “mess container” with this clever idea from Picklebums. 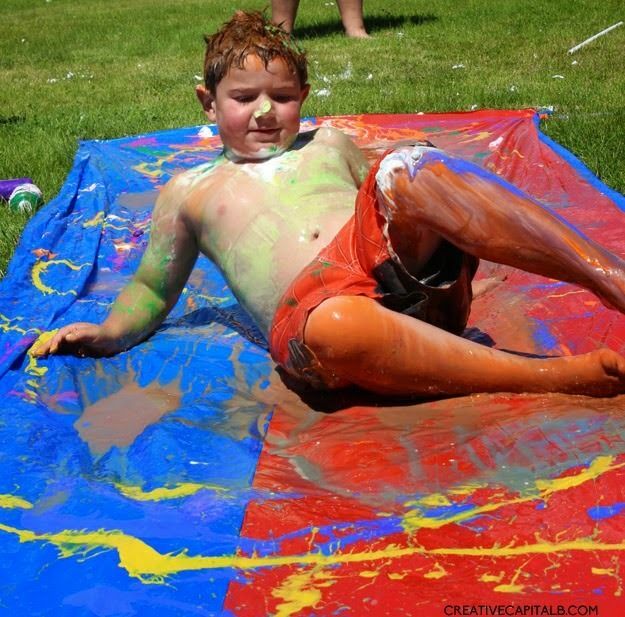 Our older kids would enjoy painting patterns or a giant picture in the box, though we’re pretty sure even the most serious artists will end up rolling around in the paint by the end. 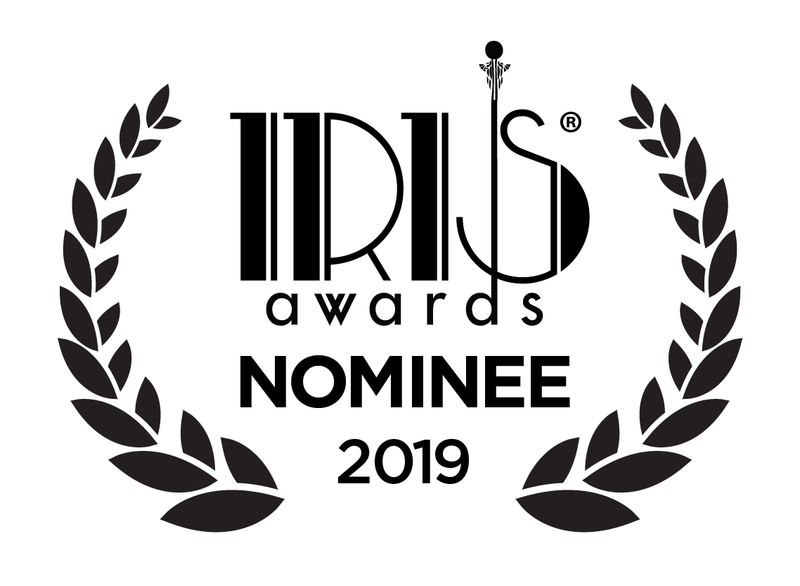 Hey, it does look pretty irresistible. 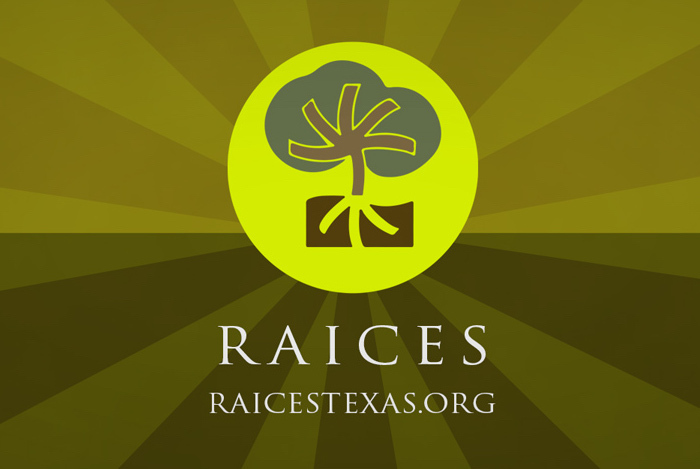 Check out the site for all the details. 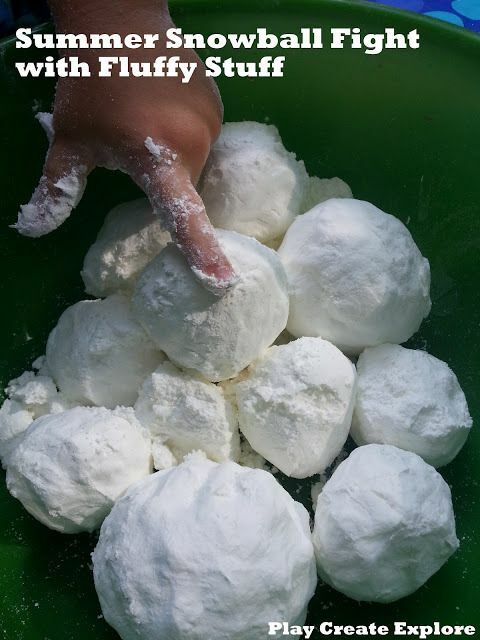 Those of us in the northeast have had quite enough snow this year, thankyouverymuch, but even we have to admit that Play Create Explore’s idea for making faux snowballs is pretty great. Let your kids decide if they want to keep them white or add some color for other-worldly purple and green snowballs. But trust us: Do this one outside. 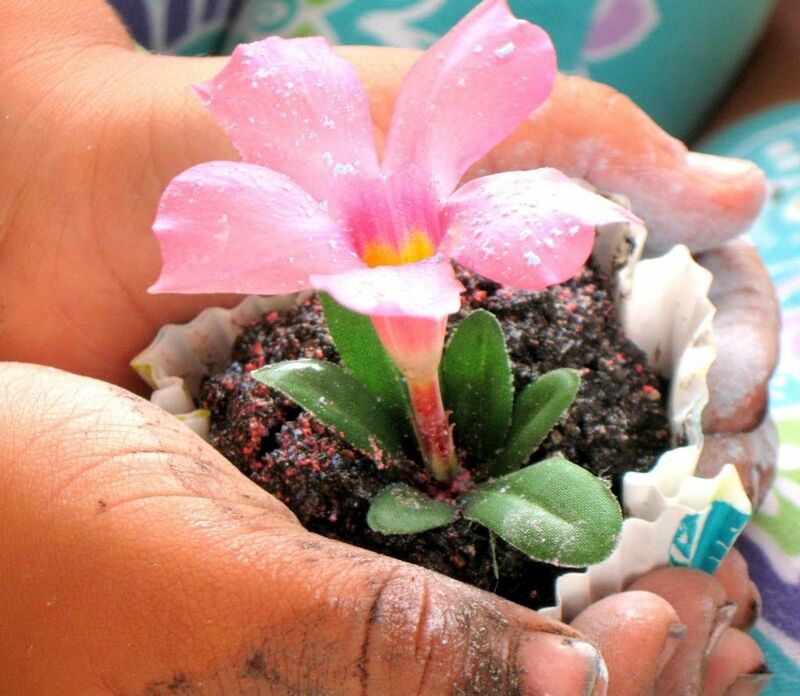 Take advantage of the nicer weather of spring and summer and take the messy play out of doors. Put down a tarp or drop cloth in the areas that are going to get the messiest. Set up a hose or sprinkler for cleanup when playtime is done. Dress kids in darker-colored play clothes to prevent any stubborn stains from settling in. Consider smocks to keep paint, mud, or shaving cream (mostly) off clothes. Make cleanup part of the playtime with a hose, some sponges, and trash bags on hand. When it’s all over, use a detergent like all free clear which gets even the most stubborn stains out, without you having to worry about harmful chemicals irritating your kids’ sensitive skin. Those little nubs of chalk at the bottom of the chalk bin make the perfect crushable chalk paint with a little water added. 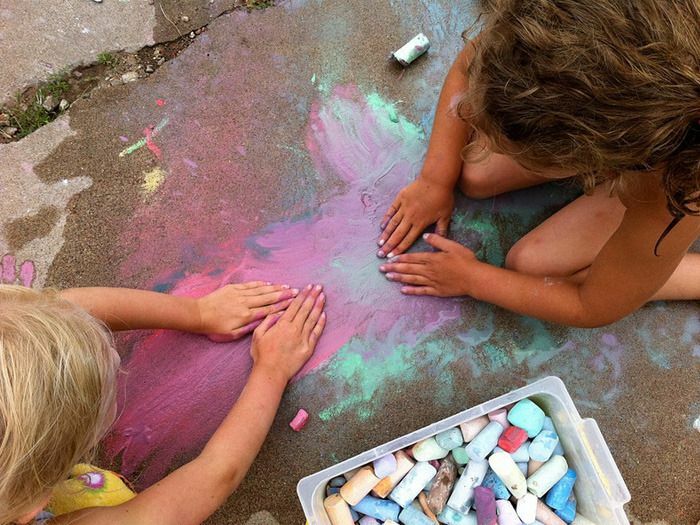 Give the kids a driveway or sidewalk and see what they create! Though, don’t expect the chalk to stay on their hands only. Once they discover that it makes a pretty vibrant body paint, it’s going there too. By the tenth hot day of summer, our kids may not be quite as excited to set up the slippery vinyl slide in the yard, so here’s a great idea to mix things up a bit from Creative Capital B. Generous squirts of washable paint or even shaving cream turn each slide into a bit of a challenge. (Exactly how much of their bodies can they get covered on a single run?) Then, just be sure to hose them off before you let them back into the house. Yeah, definitely don’t forget that part. 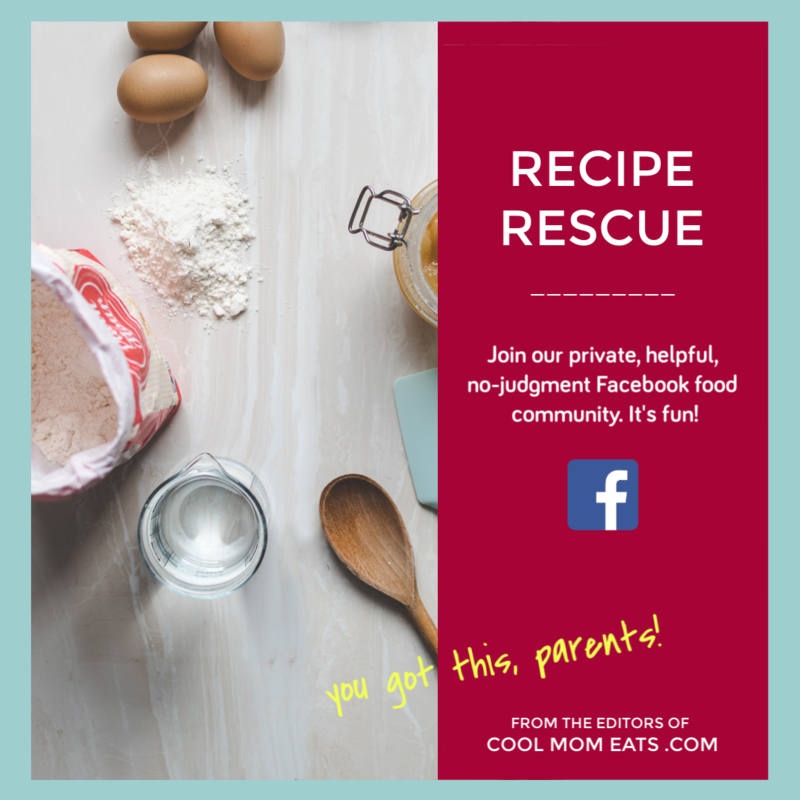 If you are going to host a Mud Tea Party you’ll need to serve snacks, and we think our kids will have a blast trying to turn sticky black mud into pretty mud cakes. 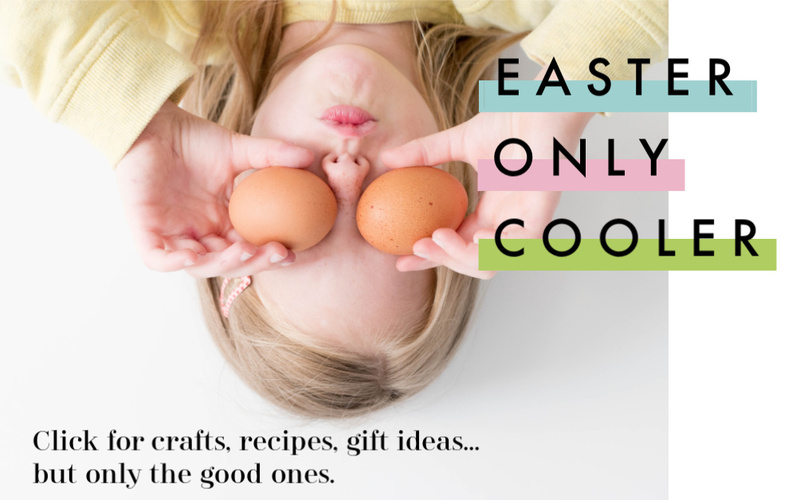 Send the kids out to gather decorations, from small flowers, to pretty rocks and colorful leaves while you raid the pantry for some extra cupcake holders and leftover sugar sprinkles. This is a great project when your kids don’t want to get head-to-toe dirty, or would just prefer a quieter outdoor activity in the shade when the temperature climbs. 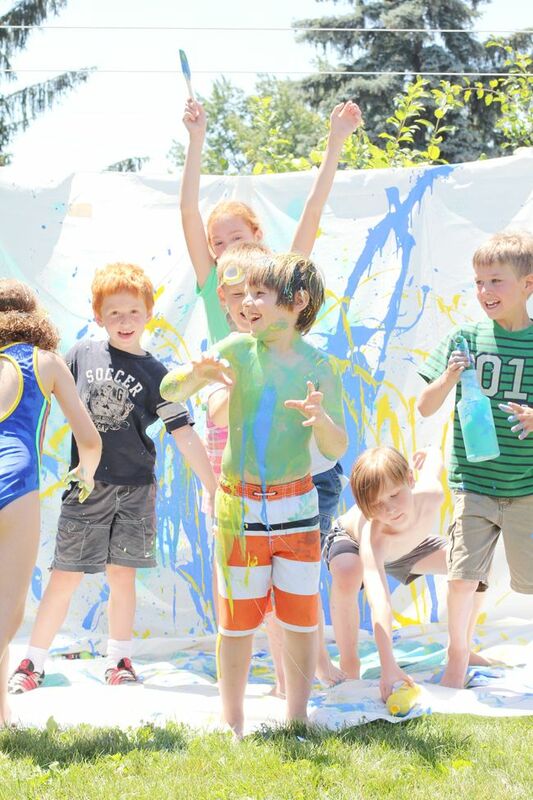 Hang an old sheet or white drop cloth in the backyard and hand the kids spray bottles of paint to decorate a one-of-a-kind giant art canvas. Visit the site for a full tutorial.No promises that all the paint will stay on the canvas; in fact, the most colorful works of art may end up being the painters themselves. 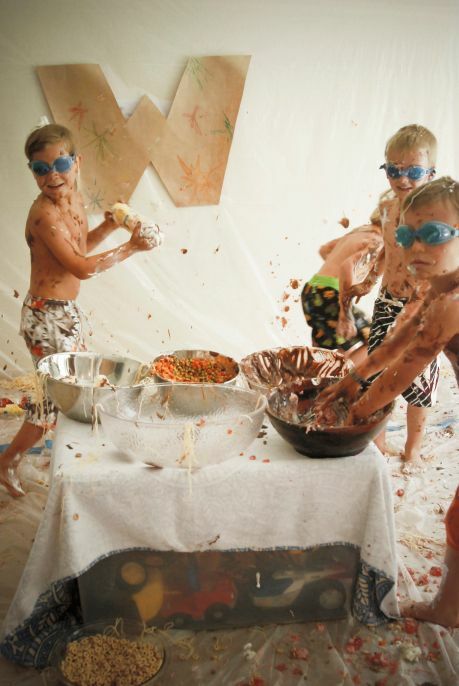 We are in awe of this California mom who somehow covered enough of her home to allow for a no-holds-barred food fight to take place indoors for her son’s most-memorable fifth birthday party. It didn’t take much preparation at all — not counting the deep yoga breathing we’d need to do to prepare. If you’re up for this, we recommend you make this an outside activity, or read her instructions for how she did it… and lived to tell about it. Thanks so much to our sponsor all free clear for giving us the opportunity to put together this super fun series for you all! Also check out our first post in this series: 11 messy projects for preschoolers that let you be The Fun Parent. Be sure to like the all free clear Facebook page for sweepstakes, coupons, giveaways, laundry tips (which we always need), and lots more. Also, check out the #FreetoBe hashtag on Twitter for stories and ideas from other parents about creating mess without the worry. 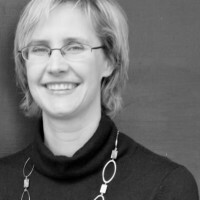 If you’d like to take a short survey after reading this post, please click here. And have fun being messy!